Airwash: Often confused with “Cleanburn” airwash is a system dedicated primarily to the task of maintaining clean glass, offering the user the pleasure of an uninterrupted view of the fire. Usually required when burning wood based products, the airwash system is most often brought into the firebox from above the door, drawn in under the natural pull of the fire and pulled down the inside of the door glass essentially producing a curtain of air between the fire and the glass. This curtain prevents any of the dirty products of combustion found naturally in wood based fuels from adhering to the glass. This is occasionally referred to as “Secondary air”. Ash carriers: A fireside receptacle to empty hot ash into. This then enables the user to safely and cleanly transport ash through the house. It also allows ash to cool. AKA Ash Caddy. Browse our Ash Carriers here. Baffle Landings: Brackets (normally welded on the insides of the stove) which form a platform for the baffle or throat plate to rest on. Baffle Plate: (See also throat plate) The baffle plate is located in the upper region of the stove firebox. It deflects the flames and heat generated by the fire around itself before exiting out into the flue. By doing this it pushes the heat toward the front of the stove and prevents the flames and heat going directly up into the flue – thus preventing excess heat loss and retaining more of the generated heat. It is normally of steel or vermiculite construction and can vary in size and shape. 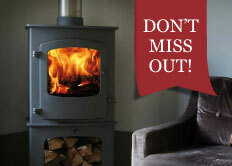 Blanking Plate: Most stoves have an option of a ‘top’ or ‘rear’ flue exit. Whichever is not connected to the flue needs to be ‘blanked’ off. This is the job of the blanking plate/disk. BTU: British Thermal Units. A unit of energy used in the power, steam generation, heating and air conditioning industries. CE Rating: A European standard by which products are rated. Coal Savers: Bricks or plates used to reduce the size of the firebox. Hence reduces coal usage, but also the heat output. Consumable items: Items such as firebricks, grate bars, glass, gasket seals, rope seals, firebricks, baffle plates etc which can wear out over time even with reasonable usage. These items are not usually covered under warranty. The lifespan of these items will depend on factors several factors. Conventional Flue: A duct, pipe or chimney for conveying exhaust gases from a fireplace, stove or range cooker to the outdoors. The primary direction for this kind of flue is vertical. Door Glass: Stoves commonly have the feature of a ‘viewing glass’ in the firebox door/s. Unlike ordinary glass it is designed to withstand high temperatures and therefore cannot be toughened. Thickness can vary from 3-5mm depending on manufacturer. In some older appliances a series of glass strips were used. Door Glass Gaskets: The glass on a stove requires an air tight seal around it. A poor seal may cause the fire to become harder to control as the fire is still able to draw in air even when closed down. There are various products available for this, some are more suited to specific styles of glasses than others. i.e Curved glass. We offer glass fibre rope, flat glazing tape, Ceramic strip or U-Shaped Channels whilst stocks last. You can see our stove glass gasket options here. Door Seals: Fibre glass rope used to form air tight seals in joins and more commonly around stove doors. It is vital to keep an air tight seal around the door just as with glass gasket seals in order to have an efficient and controllable appliance. Rope thicknesses vary according to manufacturer as well as the softness of the rope. Rope seals are normally held in place by a high temperature rope adhesive. 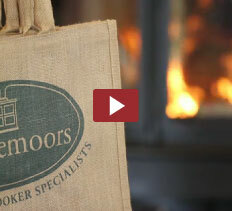 We offer a range of stove rope sizes from 4mm – 15mm which you can view here. Heatfans: Heat powered fans designed to circulate the warm air generated by a woodstove directly into the living area. These silent fans run solely off the heat generated by the stove. Normally for solid fuel stoves. We currently stock the original Caframo Ecofans and Smart Fans. Fan Flue / Power Flue: A duct, pipe or chimney for conveying exhaust gases from a fireplace, stove or cooker to the outdoors by the use of some kind of fan at a point of exit to force the exhaust gases from the appliance. Firebricks: Bricks used to line the inside of a stove. These can be made from a variety of materials including cast iron, clay or more commonly now a vermiculite fibre board. Flue Damper: Located in the flue collar or flue pipe, helps to regulate the draw of the chimney. We stock 4″, 5″, 6″, 7″ and 8″ Universal Dampers. Flue spigot: The flue spigot or collar connects the flue to the stove. AKA Flue Collars. Grate: The base on which the fire sits. AKA Woodburning grate, Multi Fuel grate, Riddling grate, Oscillating grate. HETAS: is the official body recognized by the government to approve solid fuel domestic heating appliances, fuels and services. High Temperature Rope Adhesive: The glue used to adhere rope seals and other rope gaskets to stoves. Designed to withstand high temperatures. Moisture Meters: An instrument which measures the moisture content (in this case) of wood. Multi Fuel Kit: The parts required to convert a woodburning stove into a Multi Fuel appliance. Multi Fuel Stoves: A stove which can burn coal and/or wood. Primary Air: Identified as the most important source of air required for combustion, supplying the oxygen to the area beneath the fuel. This air is therefore drawn through the fuel, ensuring that the necessary oxygen reaches as much of the fuel as is necessary. When burning smokeless fuels / solid fuels the primary air serves as a dual purpose by providing cool air to the grate system, important because the solid / smokeless fuels burn at a temperature high enough to damage the grate. Room Sealed: A term generally used when describing a combustion system which incorporates the means to draw the air required for combustion directly into the appliance. This eliminates the need for a permanently open source of ventilation into the room as the combustion air is essentially flowing straight through the stove effectively sealed from the room. Rope Seals: Fibre glass rope used to form air tight seals in joins and more commonly around stove doors. It is vital to keep an air tight seal around the door just as with glass gasket seals in order to have an efficient and controllable appliance. Rope thicknesses vary according to manufacturer as well as the softness of the rope. Rope seals are normally held in place by a high temperature rope adhesive. Secondary Air: Most often described as an “Airwash” system, this source of air is usually either drawn into the appliance from above the fuel or channelled to enter at the fire box above the fuel. This source of air is important when burning wood based fuels, as described under “Airwash”. Smokeless Fuel: A fuel which does not produce visible smoke when burned. The term is usually applied to specific solid fuels. Solid Fuel: A fuel such as coal that is solid rather than an oil or gas. Stove: Apparatus that generates heat for warmth, commonly using coal, oil, gas, wood or electricity as a source of power. Stove Glass: Stoves commonly have the feature of a ‘viewing glass’ in the firebox door/s. Unlike ordinary glass it is designed to withstand high temperatures and therefore cannot be toughened. Thickness can vary from 3-5mm depending on manufacturer. In some older appliances a series of glass strips were used. Tertiary Air: Occasionally defined as a “Cleanburn” system, this source of air is frequently introduced into the products of combustion either directly at the flames or just above where the un-burnt gases are suspended before being drawn into the flue. Where as the primary air will provide the necessary air required for combustion the tertiary air will introduce oxygen into the hot gases igniting any remaining flammable material, thus providing a more thorough burn. Throat plate: (See also baffle plate) The throat plate is located in the upper region of the stove firebox. It deflects the flames and heat generated by the fire around itself before exiting out into the flue. By doing this it pushes the heat toward the front of the stove and prevents the flames and heat going directly up into the flue – thus preventing excess heat loss. It is normally of steel or vermiculite construction and can vary in size and shape. U-Shaped Channels: A fibre glass ‘U shaped channel’ is one type of gasket used to form an air tight seal around stove glass. 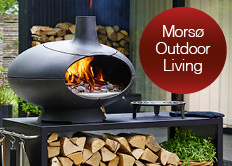 Woodburner: A stove which uses wood as its sole fuel.